Reigning Dunlop MSA British Touring Car Champion Ash Sutton surged from eighth on the grid to grab a dramatic win in the opening contest at Knockhill. The 1.27-mile Scottish circuit threw up an enthralling race in treacherous conditions, which included hordes of eye-catching overtaking manoeuvres throughout the field. Pole-sitter Dan Cammish held the advantage off the line as the Honda Civic Type R showed good pace in the early running. The privateer-run BMW of Stephen Jelley was busy holding off the works’ duo of Andrew Jordan and Colin Turkington, whilst a gaggle of cars attacked them from behind. Jordan seemed to do his title contending team-mate Turkington a favour by blocking BTC Norlin Racing’s Chris Smiley on the first lap, and when the spray cleared it was Turkington in third. 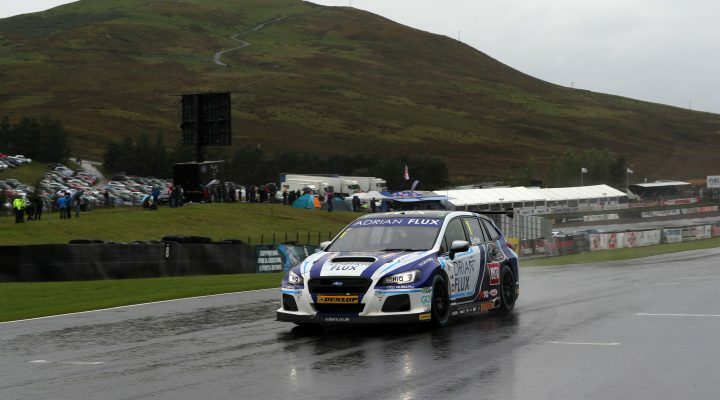 The Team Parker Racing car of Jelley then swapped positions with Team BMW’s Turkington no fewer than three times as both drivers endured slippery moments in the heavy rain. It was an exciting tussle that built towards an unfortunate crescendo, when the two cars touched and Jelley’s podium hopes were ended in the gravel on lap 19. Sutton was already ahead at this point as he made light work of the BMWs ahead of him, before he scythed past then leader Cammish in the Halfords Yuasa Racing car. Cammish then fell into the clutches of the Bavarian machines and seemingly had little defence, but he was able to get himself back on the podium after the Turkington/Jelley incident. Sutton eventually cruised to his fifth win of the season – clocking the fastest lap in the process – as championship leader Turkington took a relatively lonely second by the time the chequered flag fell. Cammish completed the rostrum positions, as Jordan held on to fourth ahead of a charging Josh Cook. Power Maxed TAG Racing’s Cook completed his own impressive run from tenth of the starting grid. The Bath racer picked off one rival after another with his final pass by Tom Ingram’s Toyota securing a top five finish. Speedworks Motorsport’s Ingram produced a damage limitation performance by starting and finishing sixth, ensuring that Turkington’s championship advantage has not been extended too much. The Ciceley Motorsport duo of Tom Oliphant and Adam Morgan finished seventh and ninth respectively, with the fading Smiley wedged between them at the finish. Scotsman Rory Butcher rounded out the top ten after the AmD MG man made the most passes during the race – rising up 13 places in front of his passionate home crowd.